Possibly the most famous Austrian ski resort, the cosmopolitan and upmarket Kitzbühel has a picturesque and lively alpine centre with a fine selection of fashion boutiques and trendy restaurants. On its 179km of perfectly groomed slopes, beginner and expert skiers alike can enjoy the winter fun along with some stunning alpine sceneries and legendary après-ski scene. Ski property for sale in the Kitzbuehel area includes some swanky luxury mountain chalets, ski apartments and new build residential houses close to golf courses in affluent neighbourhoods. Domus Global covers all popular locations in the area, including real estate in trendy Kitzbuehel, Kirchberg and Jochberg. This is clearly one of the best Austrian real estate on the market. 3-bedroom fully serviced apartment for sale in a boutique hotel in Kitzbuehel. First-class amenities and close vicinity to ski lifts. 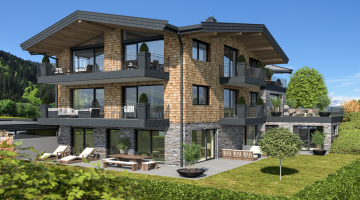 Three stunning new built chalets for sale in Kirchberg. Peaceful yet close to all action, these properties will present the highest standard of living. Two brand new mountain chalets for sale in Kirchberg close to lifts. Stylish country house on the golf course in Kitzbuehel. Spacious, elegant and nestled in an affluent neighbourhood, this property will be the perfect alpine home. Four exclusive lakeside apartments on the Schwarzsee near Kitzbuehel. Close to pistes and golf course. High standard of alpine living in the Kitzbuehel Alps. Elegant luxury residence right above the Kitzbühel golf course. Sunny location with unobstructed views of the alpine world. Complete with underground parking, wine cellar and wellness. The perfect house for sale in Tyrol. Pretty centrally located apartment on the edge of Kitzbuehel, walking distance to lifts and centre. With 2 bedrooms and smart layout, this ski property is the perfect hideaway to enjoy the superb skiing of this world-known ski resort nd its legendary après ski scene. A rare find - a luxury ski-in chalet located in the pretty Jochberg, one of the centres of the Kitzbuehel ski area in the Tyrol. Thoughtfully appointed in traditional alpine style yet with all modern comforts, creating the perfect alpine hideaway. Austrian property market is one of the most stable in Europe with healthy rates of rental yield. Can we help you to find your dream property? If you have not enough time to look at our featured properties or you have not found what you are looking for, please fill in the form below and we will answer within one working day. Unlike most agencies we source properties based on client's wishes from the entire market offer at no additional cost. Our curiosity about investment in Austria turned into a real business plan successfully completed thanks to Petra Řeháková of Domus Global. The help with buying an apartment in Schladming was priceless, the company provided us a comprehensive care including assistance with tax issues. Thanks a lot! Anyone who's skied or hiked in the Italian Dolomites may struggle finding a similarly dramatic and scenic mountain landscape elsewhere in the European Alps. But if you love a spectacular panorama with rocky alpine peaks and steep cliffs along with wild natural experiences, the Hochkönig area in northern Austria may just do the job. This splendid Austrian resort nestled in a narrow valley under the Hochkönig massif yet just 50min away form Salzburg, is a great getaway that will encourage you to disconnect from everyday routine and simply rejoice in the alpine surroundings.